The Minnesota Twins are working on overcoming a terrible start, again, but with the right tools in place, they could turn it around. First, a majority of the players are under performing. Miguel Sano, Brian Dozier, Byron Buxton, Eddie Rosario and Byung Ho Park are all everyday players who have not preformed up to standards. Oh, that is just a few of the hitters in this lineup that are not preforming. The Twins started the season 0-9, but have built their record up to 4-10 after winning four games straight, but played terrible against the Milwaukee Brewers. Yeah, I guess building your record to 4-10 is a positive. Go figure. Sano is not a right fielder. He is just not suited to play the position, and every fan knows it. The biggest issue is slump in the batters box. Sano has been chasing at many pitches and ranks fifth in strikeouts with 19, in 14 games. That’s a lot of strikeouts. He finally hit his first home run, but his average is still under .200, and that needs to change for the Twins to be successful. Brain Dozier has been awful as well, hitting .200. Dozier has not been the extra-base hit machine that fans once loved. He his hitting into the defensive shift constantly, but has done a good job of having productive at-bats. He fielding has been concerning as of late, but it should shore up as the season goes along. Korean slugger, Park, has shown that his power is legit. He smashed a 466-foot home run over the batter’s eye in centerfield to prove that. Along with his power come the strikeouts. Park is second on the team with 16 strikeouts in 12 games. He swings over breaking-ball pitches in the dirt over, and over and over again. If he starts lying off the balls in the dirt, he may be the .270 and 20 home run hitter we were hoping for. Buxton and Rosario have been just as bad, striking out and not putting the ball in play. They are two of the fastest guys on the team, but do not seem to have the knowledge to put pressure on the defense. I would like to see them put the ball in play, by bunting or by just hitting the ball, and wreak havoc on the base paths. 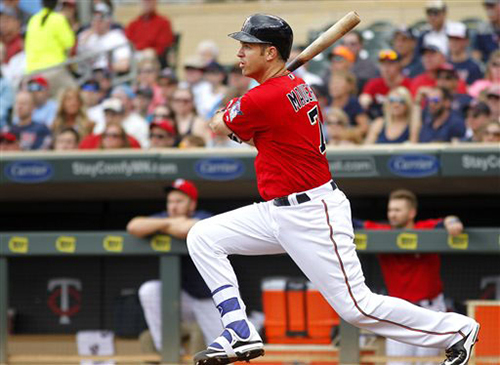 Joe Mauer has been a lone bright spot for the Twins this entire season. He is hitting .340 with 10 walks, both top-20 in the big leagues. Mauer only has four RBI, but a lot of that has to do with the hitters in front of him not getting on base. Mauer has been a breath of fresh air, and the Twins need to get some guys on base and watch Mauer drive them in. Eduardo Nuenz sparked the Twins four-game winning streak, and with Trevor Plouffe on the DL, expect that trend to continue. Nunez is hitting .500 in 10 games, going 13 for 26. He is making his speed a factor by taking extra bases when he can, and really pushing the Twins back into the thick of thing, however far away that is. Surprisingly, the starting rotation has not been an issue. All of the starts have preformed well and are keeping the Twins in every ball game. If the starters and the offense can get in sync, the Twins have a decent team that can play .500 baseball. Without the combination of the two, the Twins have nothing. The Twins ranked eighth in MLB with a 3.38 ERA to start the season., but only one starter has registered a win for the team, Phil Hughes. The Twins’ bullpen has been awful. They have cost the Twins almost as many games as the offense has. Kevin Jepsen has three losses already as the teams’ closer, and Glen Perkins is on the disabled list. Perkins wasn’t pitching great to start the year, but losing an All-star closer isn’t helping this team. What used to be one of the Twins’ strongest qualities is now its weakest. Without people stepping up in an era of baseball that almost requires a nasty bullpen, the Twins could be in for a long season. The solution for the Twins seems simple, start hitting the ball. But, anybody can tell you that. The Twins have to start hitting the ball, and more importantly hitting the ball with runners in scoring position. It is a marathon, not a sprint, but the Twins have to start to figure things out quickly. Their offense is shaky, and a team that was supposed to contend for a playoff spot is falling off the map fast. If Sano and company and get back on track, maybe, just maybe, the Twins will be in contention. Luke is the Sports Editor at the MSU Reporter. Luke has a passion for sports along with writing about them. Follow him on Twitter for his expert (sort of) opinions on everything sports related at @llonien20.